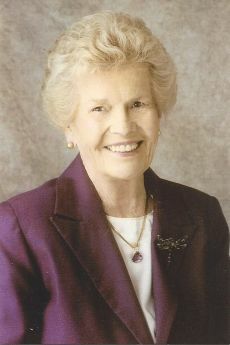 Jacqueline Hyde, 95, passed away peacefully March 29, 2017 in Santa Barbara. She was born on Feb. 1, 1922. At the age of 16, she was swept off her feet by the love of her life Joseph Hyde. They were married in Las Vegas in 1940. After the war, they settled in Los Angeles and began raising a family. They moved to Santa Barbara in 1962 where they developed several student housing projects in Isla Vista. Jackie was always vivacious and fun loving with a wonderful sense of humor. She loved social gatherings with family and friends especially at Christmas time when she would make hand knitted blankets for gifts. She was a devoted and loving wife to Joe Hyde who passed away in 1974. She is survived by her three children Robert Hyde, Bonnie Jo Danely, and Elaine Mattson along with their spouses Danielle, Joe, and Stephen. Also grandchildren Christopher, Grant, Heather, Geoff, Greg, twins Katy and Jenny, and 10 great grandchildren. She is also survived by a twin sister Geraldine. A celebration of her life for family and friends will be announced at a later date.